Mumbai: Education in Ireland, the Irish government body that promotes Ireland as a location for international education, organized its 5-city education tour on November 22nd at St. Regis, Mumbai. 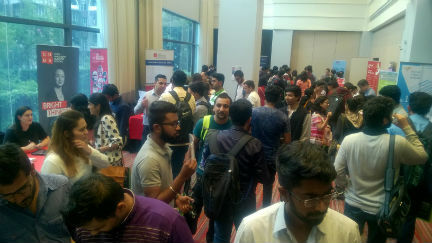 This year, the education fair in Mumbai was attended by more than 330 aspiring Indian students who got the chance to explore the opportunities provided by Education in Ireland. Eighteen of Ireland’s top Higher Education Institutions (HEIs) are on a 5-city road show to meet and counsel interested Indian students by addressing their queries about courses, international exposure, internship opportunities, University – industry linkage through research and business collaborations, available scholarships, 24 months stay-back visa options for Masters and PhD students and job security. The academics were also present to discuss detailed content of the courses, the type of assignments involved, and the career opportunities post study. Ireland, which has long, been considered the destination of choice by students from countries including China, Malaysia and US; is witnessing a rise in the inflow of Indian students to the country especially in the fields of biotechnology, business, Information communication technology, pharma, accounting and finance. The other courses that attracting increased attention are hospitality, hotel management, tourism studies and culinary arts. At the fair, a specialised visa advisor was present on behalf of the Irish Embassy to counsel students on the eligibility for a student visa in Ireland along with HDFC Credilla who provided information on education loans. The fair will continue in Chennai on 25th and Bangalore on 26th of November.